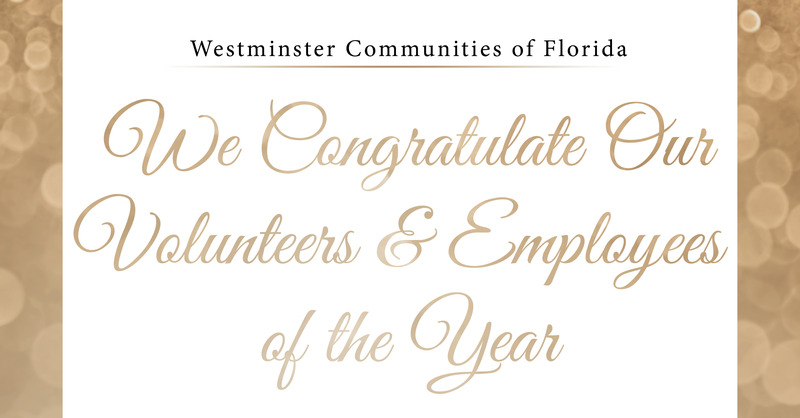 THURSDAY, March 28, 2019 – Westminster Communities of Florida threw its 21st Annual Awards Banquet to celebrate its exemplary Employees of the Year and Volunteers of the Year. The Creating Legends Program was developed to help managers "catch our employees in the act" of providing Legendary Service to our residents, their family members, and co-workers. In 2018, there were more than 140 employees caught in the act of providing Legendary Service. We also had the help of more than 2,500 volunteers, serving approximately 275,000 hours, which is equivalent to the work of 132 full-time employees. Each recipient received a plaque of appreciation presented by CEO Roger Stevens. We are thankful and privileged to have so many wonderful employees and volunteers who consistently "stretch" to serve our residents and benefit the greater community. And thank you to the Board of Directors and the Banquet Committee for making this event possible. Each of our Employees of the Year and Volunteers of the Year express the heart behind our Mission. We are delighted to shine the spotlight on these exceptional people. View their stories in the slideshares below.